Every day A wakes up in a new body. A is neither male nor female, as A doesn’t have a body. A is a being that goes from one person to the next every day. A is always aware, and always makes sure to never become attached, to avoid being noticed and to not interfere. But all that changes when A meets Rhiannon, the girlfriend of Justin, who A has woken up in the body of. All of a sudden A has found someone to want to see, every day. 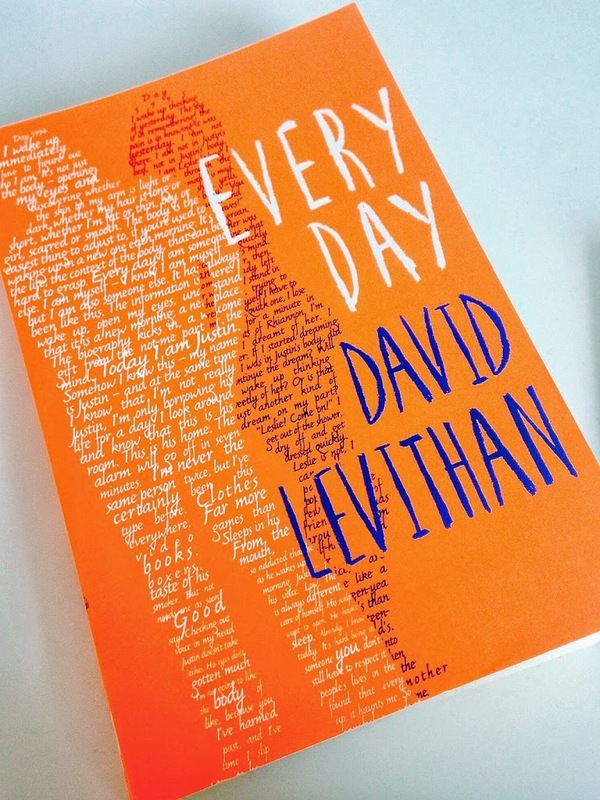 I had been told, time and time again, by other bloggers and authors that this book is the one that I should read… the other David Levithan books are good, but Every Day is where its at… and when I read Two Boys Kissing I shunned that idea because surely, surely, it could not be as good as that. I was wrong, they were right. Every Day was beautiful and moving and so odd that I loved it just as much as Two Boys Kissing, but I think they are on par with one another! It is going to be very difficult to write about this book without spoiling anything. Its not a spoiler to say that A meets Rhiannon and falls in love with her because it happens in the first chapter. Its what happened after that which is all spoilery. I really enjoyed the story because it brought up many questions about what is morally right and wrong – and how that affects a person who isn’t actually a person as they don’t have a physical form. The ending was fantastic and I thought it stopped at such a brilliant point, I think my favourite ‘host’ body was that second to last one that A was in. The questions that this book picks up on are just as valid for people who don’t switch bodies every day as much as they are for A. A witnesses people doing things that are bad for them the entire time A is in other peoples bodies and tries not to interfere but theres a perfect example within the book where A has to interfere because its the right thing to do… or is it? That chapter and that person A inhabits was the one that will stick with me now that I have finished this book because it really is the one which posed the most questions. A was just a being so its hard to talk about them in this review… A was neither male nor female but I find myself wanting to type he because in my mind A did sound male, all the way through the book even when A was in female bodies, I still heard his thoughts with a male voice… Its an interesting thing to think about really because I don’t know if thats because the author is male, because A was in love with Rhiannon and my brain subconsciously thinks that A must then be male, or because the author wanted A to come across as male… I have absolutely no idea but to me, I think, A felt more at home in male bodies and I think if A could stick to one body it would be a male one. But thats just my opinion. I really did love Every Day. I think its just as brilliant as Two Boys Kissing and hearing David Levithan talk about it at the event I went to with him during the time I was reading the book was incredible because you can tell he loved writing it. I now have another 3 David Levithan books to read and I cannot wait! Every Day was published in September 2013 by Electric Monkey. My copy was sent to me by the publisher in exchange for an honest review. I have also heard nothing but great things about this book, and I’m excited to read another stellar review! I’ve got to add this one to my TBR pile!